It was very satisfying to note that many of you have liked the routines and principles explained in the predecessor to this, i.e, Credit Kard Tantra . Thank you for your great response and support. Here is another collection of 15 amazing effects (including variations), a bonus routine and some bonus ideas - all of which can be done with any participant's credit/debit cards. Almost impromptu, self working and easy to perform routines which do not need any DIY or arts and crafts with either your or the participant's cards. Most of these routines can also be performed over phone or skype. Some of the routines can be done using any participant's driving license or social security numbers as well. The effects themselves are based on some lesser known principles and some novel application of well known principles. All the routines are mostly hands off. All the 15 effects are mentalism themed routines. There are no sleights, no threads, no stooges, no magnets involved. There is practically nothing to reset between performances. 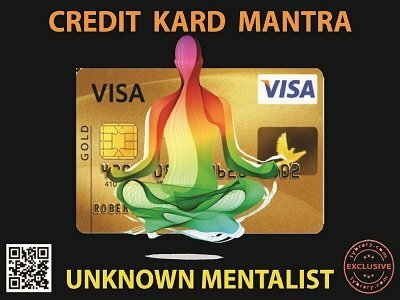 You will surely be surprised to learn that all these years you were 'carrying' so many potential effects right on your ungimmicked credit/debit card. 1st edition 2017, 25 pages.